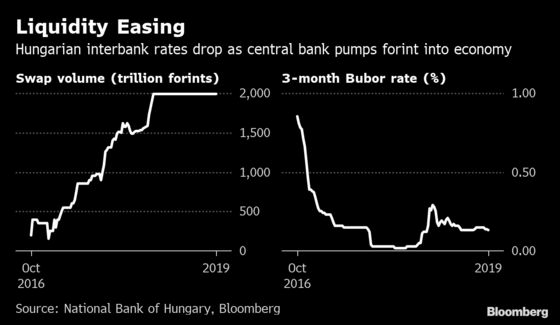 (Bloomberg) -- Hungary is set to start wrapping up one of Europe’s longest ever monetary-stimulus campaigns, though it’s unclear how aggressively it will tighten policy. In a sign that monetary tightening is imminent, the National Bank of Hungary announced on Tuesday that Governor Gyorgy Matolcsy will hold a press conference in Budapest following the rate decision. In the past, the central bank has held post-decision briefings when it announced a policy shift. With a key gauge of inflation speeding past the bank’s target, policy makers have vowed to deliver a blueprint for unwinding more than half a decade of unconventional stimulus. 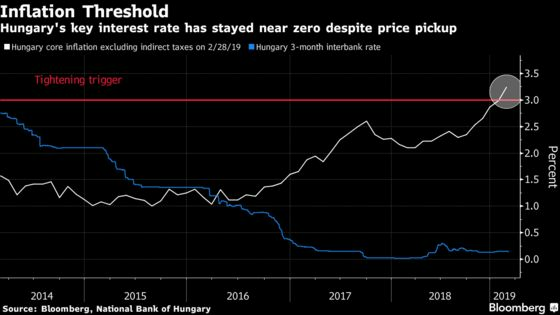 But with big global central banks reining in, or even reversing, plans to tighten monetary conditions, the National Bank of Hungary is having to walk a tightrope between living up to hawkish rhetoric without stalling the economy. To lift borrowing costs, the Monetary Council may adjust the corridor of overnight rates banks use to deposit or borrow money or scale back a foreign-currency swap program aimed at managing liquidity. Here’s a breakdown of how it will unfold and what to look out for. 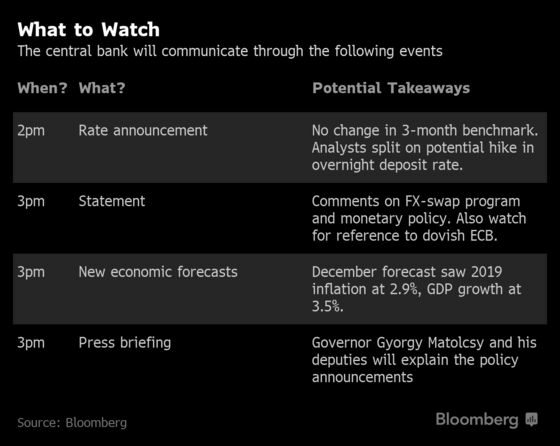 The earliest indication of policy makers’ intentions will be at 2 p.m. in Budapest, when the central bank will announce interest-rate levels on a conference call to journalists. While no change is forecast for the base rate, an instrument that has mostly lost its relevance due to the unconventional toolkit, analysts are split over whether an increase in the overnight deposit rate from -0.15 percent will happen. "Even a modest hike of 10 basis points will send a clearer message to the markets that the central bank is now in a tightening cycle," TD Securities analysts Paul Fage and Izidor Flajsman wrote in an emailed note. Another instrument for tightening would be an adjustment to the foreign-currency swaps program used to pump forint into the economy. In December, the central bank set an excess liquidity target of "at least 400 billion-600 billion forint" ($1.4 billion to $2.1 billion) in the first quarter, which has been interpreted as the net cash held by banks in the overnight deposit instrument. Now a reduction is in order. "The council will drop the ‘at least’ part of the reference," said Marcin Kujawski, an analyst at Nomura International Plc. "Inflationary pressures will lead to continuing policy normalization in the months to come." For investors, the most-closely watched signal will be any indication of the pace of future tightening. The forint has been torn between the opposing forces of a central bank that’s starting to tighten in a dovish universe and speculation that further moves to raise rates may be slow to follow. Central bankers have said any normalization will be "gradual and cautious." Forward-rate agreements used to wager on future borrowing costs are pricing in less than half a percentage point increase in interbank rates by the end of the year. "The statement will likely continue to refer to gradual and cautious policy normalization, emphasizing the importance of keeping inflation under control," JPMorgan Chase & Co. analyst Nora Szentivanyi said in an emailed note. "For the communication to surprise on the dovish side, we think the statement and/or press conference would need to signal the small tightening as a one-and-done move, rather than a part of a tightening cycle."